A Roman altar has been "forcibly wrenched" by a thief from an open display at a museum in Cumbria. 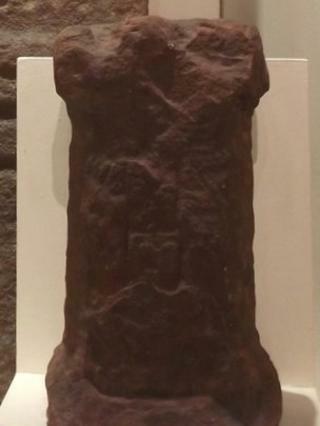 The red sandstone altar was taken from the Senhouse Roman Museum in Maryport during opening hours on Thursday. Discovered in Maryport in 1880, the altar forms part of the Netherhall Collection. Museum manager Jane Laskey said the museum was "devastated" by the theft, which she said would have left the altar damaged. The 10in (25cm) tall, 5in (13cm) wide altar was mounted for secure open display. Ms Laskey said: "It has always been a priority to us that the collection is made accessible to everyone and we have trusted members of the public to value the collection too. "It is very unpleasant to find that someone abused that trust to steal something that is such a significant part of the heritage of the people of Maryport. "As a result of this incident the museum's security has been reviewed," Ms Laskey said. In the 16th Century, John Senhouse began to form the Netherhall Collection of inscriptions and sculptures which, according to Historic England, later became the largest private collection of Roman antiquities from one British site. In 1870, 17 altars were found buried in Maryport, all dedicated by the fort's garrison commanders to the Roman god Jupiter. The museum said the stolen altar's value is its importance as part of the Netherhall Collection rather than its monetary worth. CCTV footage from the week of the theft has been given to police, who say they are investigating.